Whether it's software, a cell phone, or a refrigerator, your customer wants no, expects your product to be easy to use. This fully revised handbook provides clear, step-by-step guidelines to help you test your product for usability. Completely updated with current industry best practices, it can give you that all-important marketplace advantage: products that perform the way users expect. You'll learn to recognize factors that limit usability, decide where testing should occur, set up a test plan to assess goals for your product's usability, and more. Acknowledgments. Foreword. Preface to the Second Edition. Part One Usability Testing: An Overview. Chapter 1 What Makes Something Usable? 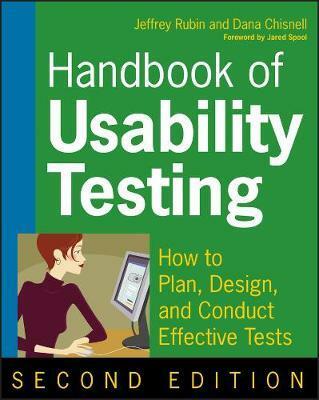 Chapter 2 What Is Usability Testing? Chapter 3 When Should You Test? Chapter 4 Skills for Test Moderators. Part Two The Process for Conducting a Test. Chapter 5 Develop the Test Plan. Chapter 6 Set Up a Testing Environment. Chapter 7 Find and Select Participants. Chapter 8 Prepare Test Materials. Chapter 9 Conduct the Test Sessions. Chapter 10 Debrief the Participant and Observers. Chapter 11 Analyze Data and Observations. Chapter 12 Report Findings and Recommendations. Part Three Advanced Techniques. Chapter 13 Variations on the Basic Method. Chapter 14 Expanding from Usability Testing to Designing the User Experience. Afterword. Index.